Aladdin's Gold Casino Review - Is Aladdin's Gold Casino Legal? Players looking for an online casino who live in the United States can sign up and play at Aladdin's Gold easily and safely. Aladdin's Gold is one of the best legal online casinos that take USA players as long as those users meet the legal age to gamble at a casino in their respective states. Launched in 2004, Aladdin's Gold Casino is operated in the UK which is home to several of the best casinos online. Known for bringing players a fantastic overall experience through their fantastic RTG casino games, generous sign up bonuses, and other things like their easy deposit + payout options make this a top choice for anyone in the market to win money playing casino games online. Within this review of Aladdin's Gold Casino, users will find a breakdown of the different features they can expect to see when using Aladdin's Gold. Included in this are details about the sign up process, how to transfer money in and out of the casino, as well as the games and software that power this fine website. The first step at Aladdin's Gold, if you choose to play there, will be creating your account. This will be your basic profile that is created to put you in their system however, other information will be needed when it comes time to fund user accounts. For the purpose of this section, it's just about the basics like creating a name and login password for you to get started. Fill out your profile information including name, email, address, phone number, etc.. and then you will need to verify that you are of legal age to play online casino games. Once all of that information has been submited, users will then need to verify their email address through the automated email sent to new players. This ensures their network isn't filled with spam accounts and it also helps to ensure that you actually wanted to open that account... this part is for your online safety. The cashier section at Aladdin's Gold has complete information on depositing. But we want to focus on USA friendly deposit methods, and at this online casino, there are multiple to choose from. Two major credit cards (Visa and MasterCard) are accepted ways to deposit if you live in the United States. A deposit of at least $21 needs to be made into your account, while not exceeding $1,000. This type of credit card transfer takes place very quickly, ensuring that the priority is placed on account holders getting to game play quickly and efficiently with no problems on the depositing end. Outside of this welcome bonus, there are other categories of bonuses. They are daily, weekly, and special promotional offers. Weekly promotions change all the time, while the special promotions typically center on the V.I.P. rewards program at Aladdin's Gold. Without going into all of the nuts and bolts of each, just know that this online casino for Americans is definitely one that takes care of its existing users... not just the ones they are trying to entice. When it comes to the games, that's what it all boils down to right? You want to play something that is fun, and you can win! There are over 120 casino games offered. Play a wide variety of great slots, traditional, and progressive with big jackpots. Get down on some blackjack, spin the wheel on roulette, or roll the dice on craps! Aladdin's Gold details the complete set of games on site to prospective players interested in finding out more. Be sure to visit and review the types of games you are most interested in. Aladdin's Gold Casino Software - What's Under The Hood? 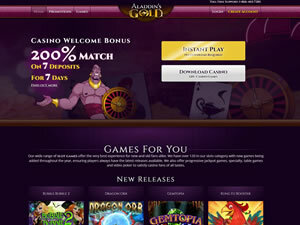 Backed by Real Time Gaming, Aladdin's Gold is a great online casino experience. As an RTG casino, that comes with a high reputation, and the knowledge that this casino is very safe and secure, and as good as it gets in terms of technology. Get your winnings in the mail through a courier check from Aladdin's Gold - they will send you a check for the desired amount that you want whether it's for all or just a portion of your account. Don't expect to get this check over night though! Waiting for a check to arrive could take some time, and in some cases, up to a couple of weeks. A wire transfer is another acceptable and fast method for U.S. players. This process can take up to five days, but on the whole the process is quite fast. Higher than average fees do accompany the use of wire transfers but they do vary based upon the amount withdrawn from the account. Contact Aladdin's Gold customer service through phone at (866) 465-7285, chat live on site to a customer representative, or send them an email through the contact form on the 'Contact Us' page offered through the site. Aladdin's Gold encourages those with questions to ask so that the best info can be relayed to the person inquiring.